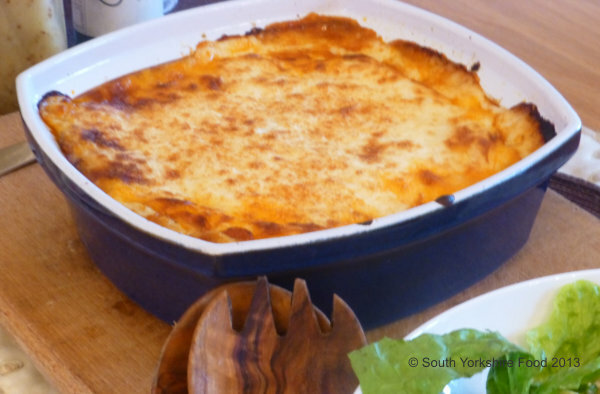 Almost everyone loves a great lasagne. This recipe from Guest Chef Brenda Clough, is especially tasty, and offers a quick 'cheats'bchamel sauce, as well as the traditional way of making it, both with the addition of some parmesan cheese for extra flavour. Heat the oil in a saucepan over a medium heat and sauté the chopped shallots and crushed garlic for for 2 minutes, until soft but not coloured. Add the minced beef steak and and sauté for a few minutes until browned. Add the wine and cook for a further minute. Now add the chopped tomatoes, tomato purée, the crumbled beef stock cube and the dried herbs. Cover with a lid and simmer gently for 2o minutes. Remove the lid, raise the heat and cook for a further 5-10 minutes until the sauce has reduced and thickened a little. Stir occasionally to prevent the sauce sticking to the bottom and burning. Whilst the sauce is reducing, make up the béchamel sauce. Mix the cornflour with the milk in a small saucepan. Stir it constantly and cook over a low heat until the sauce thickens. Add half of the grated parmesan cheese and cook for two minutes. Adjust the seasoning, and your sauce is ready. Put the milk in a saucepan with the bay leaf, and peppercorns and bring to a simmer. Pour into a bowl and leave to stand for 10 minutes. Then strain the milk into a jug. Put a clean pan back on a low heat and gently melt the butter, stir in the flour using a wooden spoon or a small whisk, and cook for 1 minute. Do not let the butter or flour brown. Take the pan off the heat and add the milk in 3 steps. At each stage beat or whisk the milk into the flour until it is completely smooth. Once the milk is all in, bring the mixture back up to a simmer, stirring all the time to stop any lumps forming. Once the mixture looks as if it will not thicken any more, add half of the parmesan cheese, and simmer it for 5 minutes, stirring occasionally, until it looks glossy. Season with salt and white pepper. If you do have a few lumps, just strain it through a sieve. Heat the oven to 200°C / Fan 180°C. In a high sided 20cm square oven proof dish, starting with meat sauce, create alternate layers of meat then pasta, and then top with béchamel. Finally sprinkle with the remaining parmesan cheese. Cook for approx 30-40 minutes until the top is golden and bubbling.